Hector International Airport is served by five major airlines - Allegiant, American, Delta, Frontier and United. 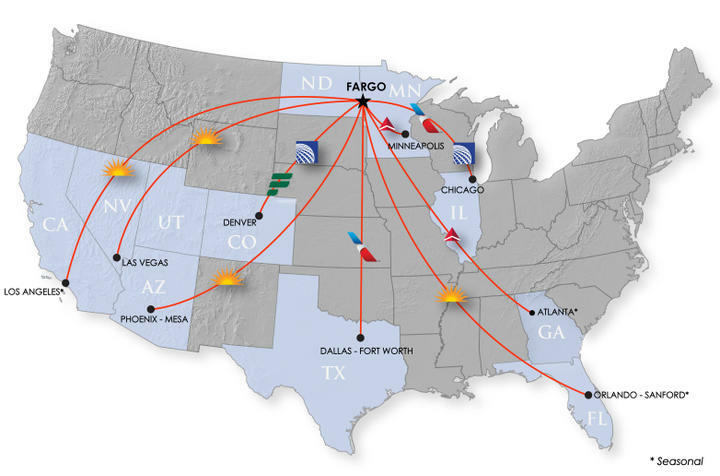 These airline partners provide nonstop jet service to the following cities: Atlanta*, Chicago, Dallas, Denver, Las Vegas, Los Angeles*, Minneapolis/St. Paul, Orlando-Sanford* and Phoenix-Mesa. To learn more about Hector International, visit http://www.fargoairport.com.